- We provide a temporary place for women and their battered children if they have no other place to go. - We give battered women time to heal, rest, and consider their options. - We care about battered women and suggest alternatives to the violence they live with. - We help battered women understand about domestic violence. - We understand that battered women feel powerless and try to help then regain control over their lives. - We refer women to other agencies for help i.e. medical, legal, and social services. - We have support groups open to all victims on Tuesday nights from 6:00-7:00, call us for details and directions to the shelter. All services are strictly confidential and provided only upon request of the woman. We do not respond to inquiries about women or share information about them without their permission. CASA has provided shelter to 6,647 clients in the last 20 years. CASA Women’s Shelter Crisis Hotline sheets indicate that 47 victims had to be turned away because of lack of space. These victims were referred to other shelters in the state of Arkansas. CASA is open 24 hours a day, 7 days a week, and also operates a 24 hour hotline. 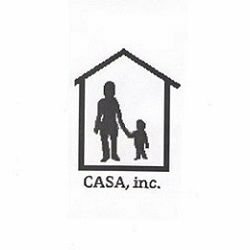 CASA provides shelter, support groups, legal advocacy, food, clothing, school supplies, advocacy, referrals, educational services, GED classes, domestic violence classes and domestic violence case management.